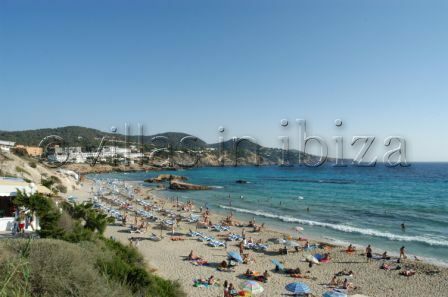 Located between Cala Vedella and Cala Conta, Cala Tarida is the longest and widest beach on the west of the island. 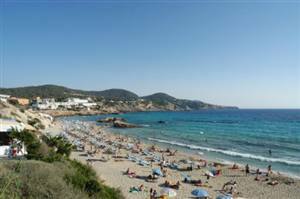 It is very popular with family’s and has a good selection of bars & restaurants that run along the beach, offering something for everyone. There is plenty of parking in Cala Tarida but to get to the beach itself you have to climb down a steep set of steps. However once you make it down to the beach, you won’t be in a hurry to leave again. As you would expect, the sea is crystal clear and the sand is fine, but an added bonus is the selection of interestingly shaped rocks for you to explore. Some of these rocks are accessible without even getting your feet wet (if you time it right). Or if you are feeling fit you can take a short swim out to one of the nearby rocks and enjoy a little peace and quiet before swimming back to shore. If you want something more than relaxation then there is also a water ski school based on the beach, or you can just enjoy the madness of the banana boat.